MeteoEarth is a pretty rad weather app for the iPad. It’s purpose isn’t really to tell you whether to take an umbrella with your to the shops, but it can do that if you like. No, what MeteoEarth is really good at is showing you beautifully-animated views of the weather as it blows and scuds across the surface of the Earth. And now you can get it for the Mac. It’s one thing to see the weather forecast for your current spot on the globe, but it’s another thing entirely to see the weather as it heads towards you across the globe, all on your 27-inch screen. 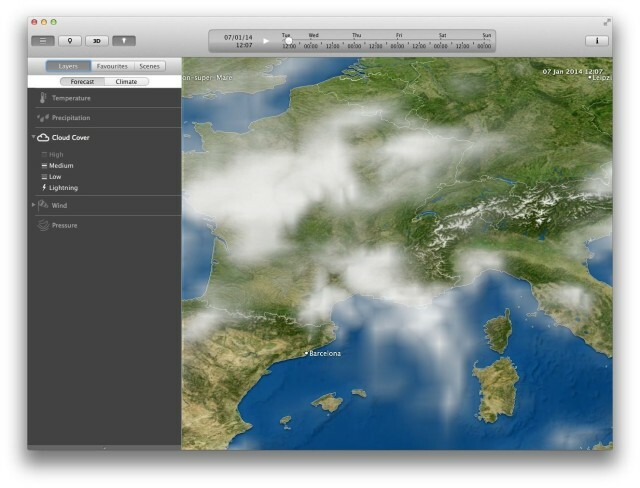 You can toggle different layers – wind, cloud cover, rain and so on – and zoo out to spin around the planet. Try it in full-screen with trackpad gestures to really enjoy it, or set it as a screensaver. Yes, a weather screensaver. It’s like 2003 all over again, only good. The app costs $5, and hooks into your iCloud account so if you already have MeteoEarth or WeatherPro on your iDevices, your favorites will show up automatically. You can also share any pro subscriptions you have just by signing in.